Many fear getting older based on a myriad of misconceptions. However, Rhode Island home caregivers want seniors to know about the various financial, emotional, and mental benefits that accompany advanced age. A variety of restaurants, stores, travel agents and entertainment venues across the country offer discounts to older citizens. Some discounts begin once an adult reaches the age of 55, while others honor older adults. In addition to extending the circle of love and caring that older adults enjoy, grandchildren brighten their lives in other ways. Watching a new generation grow up sparks pleasant memories of the past. Children also invigorate seniors by offering the chance to see the world through young eyes. After years of punching a time clock and working eight or more hours each day, seniors have the chance to turn their focus to spending more time with beloved family members and friends. Some enjoy their retirement by traveling while others devote their time to favorite hobbies or community outreach. Scientific studies indicate that getting older does not mean that the brain cells stop growing and evolving. Older adults remain capable of learning and adopting new skills. As such, many enjoy returning to school to obtain degrees that were unobtainable while working and raising a family. 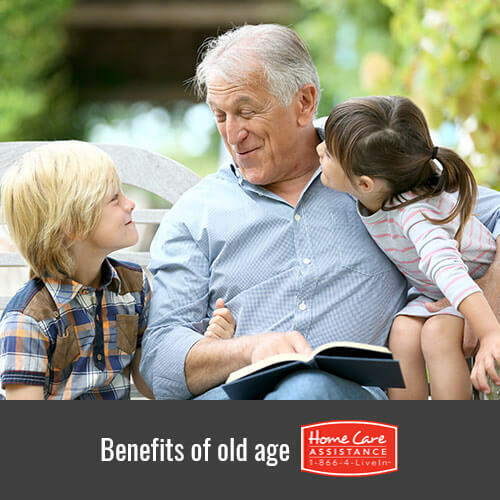 With years of life experience under their belts, seniors have a wealth of knowledge concerning many aspects of daily living. Many happily volunteer their services by mentoring younger people or teaching younger members of their families. With more time on their hands, some older adults enjoy donating their time to charity or community organizations. Churches, local groups and schools often welcome outside assistance from wise and generous seniors. Reaching the age of 65 does not mean that an older American must retire. Many choose to continue working at a job that they love. Others might turn a hobby into a business, while still others choose opting to earn degrees and seek out new occupations. As you can see, there are numerous benefits to getting older. In fact, with help from Home Care Assistance of Rhode Island, seniors can further these benefits and enjoy others. Our highly trained live-in and hourly caregivers work around our clients’ schedules to make life easier at home. We accomplish this by helping with daily tasks such as housekeeping, meal preparation, physical exercise, running errands, and so much more. By helping with these and other aspects of daily life, seniors are free to make the most of their golden years. Call us at (401) 284-0979 today to learn more and customize a unique care plan for your senior loved one.